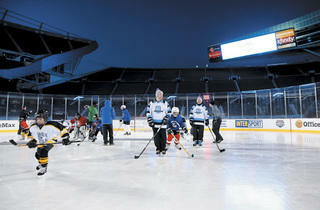 Soldier Field turns into an ice rink for two high-profile college hockey games. On Sunday 17, when Notre Dame takes on Miami (Ohio), followed by Minnesota against Wisconsin, it will be the first time Soldier Field hosts an outdoor college hockey match. It’s a natural next step for ice hockey in Chicago, considering the other notable hockey events that have hit the area in recent years, like the 2009 NHL Winter Classic at Wrigley Field. 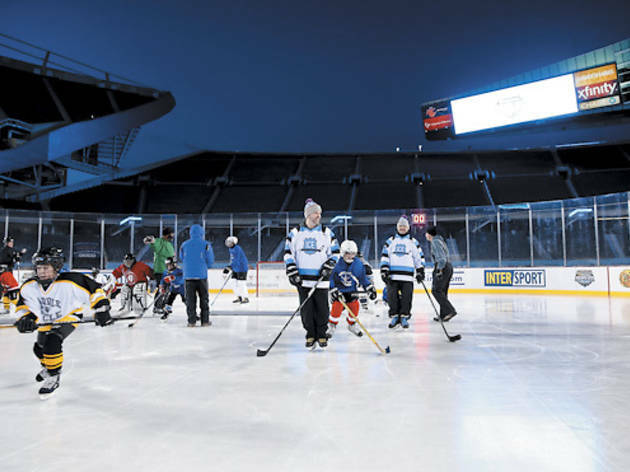 “A few years ago, when events like [the NHL Classic] started popping up all over, I knew I had to be a part of it,” says Drew Russell, vice president of Intersport, the Chicago-based entertainment and sports marketing firm organizing the Classic. With the Chicago Park District on board (it owns and operates the stadium) and Naperville-based OfficeMax looking to give to the city (it runs the marketing campaign “We Love Chicago”), Russell’s wish came to fruition. Thirty to 40 crew members constructed the rink in two weeks in late January. Since then, it’s been used for private rentals, youth clinics, a public skate and a charity meet-and-greet with current and former Blackhawks. Catch the games Sunday 17 at Soldier Field, 1410 S Museum Campus Dr (800-745-3000, hockeycityclassic.com). Noon, 3:30pm; $22–$97.